A psychoeducational evaluation, sometimes referred to as a psych-ed eval or neuropsych eval, is an assessment of how a student learns. It measures different types of reasoning, memory, and working efficiency. This is in contrast to learned knowledge, like math facts or vocabulary definitions. Pyschoeducational evaluations are most commonly recommended for students who are having difficulty in school. However, the information in a psychoeducational evaluation is great for every student. Mindprint got started as result of the founders’ own frustration with the psychoeducational process. They wanted to help other families by offering a streamlined psychoeducational evaluation at a fraction of the time and cost. In the following post, Princeton-based adolescent psychologist Dr. Carol Blum explains what a psychoeducational evaluation is, why it can require so much time and expense, and what to consider before paying for one. Question 1: What is included in a psychoeducational evaluation? 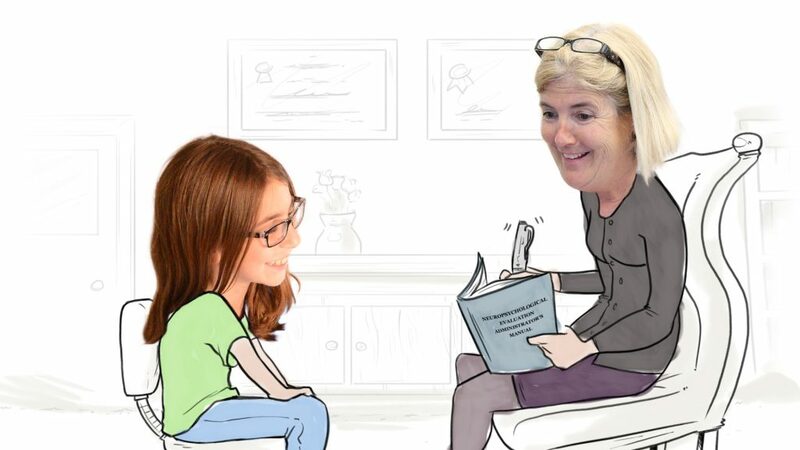 Evaluations always begin with an initial interview with parents and student and review of academic records. It often includes behavior checklists completed by the parents, teachers and student and a test of fine motor skills. Psychologists might start with a cognitive screener like Mindprint to focus their evaluation. 2. Evaluation of Cognitive Skills. The goal is an overall view of a child’s strengths and weaknesses in reasoning, memory, working efficiency and executive functions. Among the more popular tests are the Wechsler IQ tests: WPPSI (preschool), WISC (ages 6-16), and WAIS (ages 16+) Alternatively, psychologists might start with the Woodcock-Johnson or other normed and validated tests of cognitive abilities. Your clinician might have a good justification for using one test over another, but you’ll want to ask which test they are choosing and why. This testing covers reading, writing, spelling, math, listening, etc. This part of the testing can be similar to tests taken in school, and some clinicians might use school tests rather than their own. Psychologists will compare the achievement test results with cognitive tests to understand discrepancies between achievement and overall capabilities. 4. Additional supplemental tests as needed. Specific tests can be added to fine-tune understanding of specific areas that might be causing difficulty such as attention, language, memory, and processing skills. Psychologists will often add on tests if they want to confirm a diagnosis or if they need to understand any inconsistencies. 5. Personality and emotional testing. Called “projective” testing, these tests are selected according to the child’s age and emotional maturity. Personality testing may include drawing, storytelling, the Rorschach, the TAT, or sentence completion. The goal is to understand where the child is emotionally as well as cognitively, as differences in cognitive age and emotional age can impact behavior and academic performance. The psychologist will always use their own professional observations to verify a diagnosis. They might also reference teacher observations or visit the school to assess environmental or behavioral considerations. 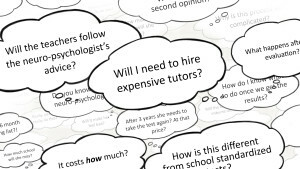 Question 2: How much does a psychoeducational evaluation cost? The cost varies widely by professional and geographic location, but a psychoeducational evaluation usually costs between $2,000 and $5,000 and the process can take anywhere from 2 weeks to several months depending on the tests administered and the number of observational visits necessary. Health insurance may cover part of the cost of an evaluation that diagnoses psychological disorders (anxiety, depression, and ADHD), but usually will not cover the cost if there is an educational or learning challenge. Question 3: How is a private psychoeducational evaluation different from the school psychologist’s evaluation? A private psychoeducational evaluation will most likely be comprehensive and include all of the above. Usually there must be a demonstrated need for the school to provide an evaluation. For example, the child might need to be more than a year or two academically behind peers on standardized tests before the school will provide an evaluation. Parents might not want to wait that long. There are certain areas a school evaluation often does not cover, including emotional challenges or behavior. Keep in mind, that the school psychologist works for the school, not the family, so their time might be limited or focused on the concerns raised by the school, not the parents. If you are having a school evaluation you will want to confirm what areas they are evaluating and what they are not taking into consideration. Question 4: When is it the right time to seek an outside evaluation and not rely on the school? A private evaluation offers more privacy to the family. Parents might opt to not share their results with the school. On the other hand, a school-based evaluation is free and available to all children, even if they attend private school or are home schooled. A private evaluation might be the only option in cases where the parent has concerns but the child does not meet the school’s demonstrated need for a school evaluation. Question 5: Are there any “in-between” alternatives? An at-home cognitive screener can be a good, relatively affordable first step for parents who have concerns but the school says the child does not qualify for an evaluation. At-home screeners can help validate concerns and decide on the best potential course of action. It offers you the privacy of a private evaluation without the cost. Keep in mind, however, that a diagnosis will still require consultation with a psychologist. If your screener results suggest that there is a problem, you can bring those results to the school as further evidence of your child’s need, potentially avoiding the costs of a private evaluation.